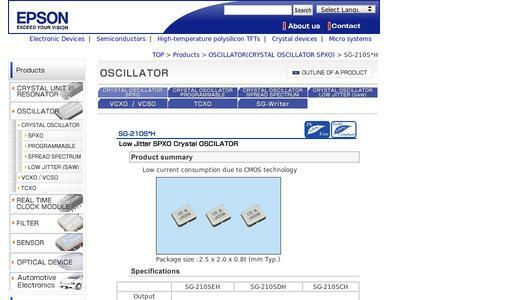 Seiko Epson Corporation ("Epson," TSE: 6724) has announced the commercial development of a new, three-product series of compact crystal oscillators. The oscillators in the new SG-210S*H series measure 2.5 mm x 2.0 mm and oscillate at a stable, high fundamental frequency in the 80 MHz to 170 MHz range. Volume production of the series is slated for April 2012. In recent years, faster digital equipment speeds and higher network carrying capacities have been driving the need for higher frequency operating clocks used in this equipment. The majority of high-frequency crystal oscillators used as clock sources come in large packages measuring 7.0 mm x 5.0 mm. Moreover, the most common crystal units (resonators) built into these products operate in third-order overtone mode, the stability of which is inferior to that of the fundamental frequency. 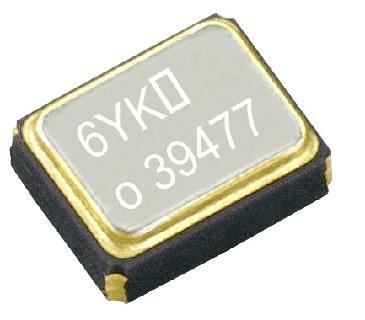 Market demand was thus rising for smaller, more stable high-frequency crystal oscillators. To answer this demand, Epson leveraged its QMEMS technology, which combines quartz materials with micro-electromechanical system technology, to commercialize the SG-210S*H series. The oscillators in this series are equipped with a built-in crystal unit that oscillates at an extremely stable fundamental frequency yet come in packages with a footprint of only 2.5 mm x 2.0 mm. Meanwhile, power consumption was reduced by approximately 70% compared to comparable existing Epson products. 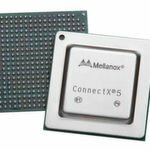 "The new series of oscillators will help enable stable, high-capacity, high-speed communication networks," said Masayuki Morozumi, Executive Vice President and Chief Operating Officer of Epson's Microdevices Operations Division. "Going forward, Epson will continue to leverage its QMEMS technology to provide customers with powerful, easy-to-use device solutions - and the ease of mind that goes with them." The small size and high stability of the high-frequency fundamental were achieved by using a photolithographic QMEMS process to thin a limited area within the crystal blank near the excitation source (electrodes) to create an inverted-mesa structure. The typical phase jitter(4) is 0.3 ps, a low value for this important property of high-speed clock sources. Epson is a global imaging and innovation leader that is dedicated to exceeding the vision of customers worldwide through its compact, energy-saving, high-precision technologies, with a product line-up ranging from printers and 3LCD projectors for enterprise and the home, to sensors and other microdevices. Led by the Japan-based Seiko Epson Corporation, the Epson Group comprises more than 78,000 employees in 99 companies around the world, and is proud of its ongoing contributions to the global environment and the communities in which it operates. Epson Europe Electronics GmbH is a marketing, engineering and sales company and the European Headquarters for electronic devices of the Seiko Epson Corporation, Japan. Since 1989 headquartered in Munich/Germany with 60 employees, Epson Europe Electronics GmbH has several European sales representatives and has a European-wide network of distributors. Epson Europe Electronics provides value added services for Semiconductors and Quartz Devices targeted to the mobile communication, automotive and home visual market. 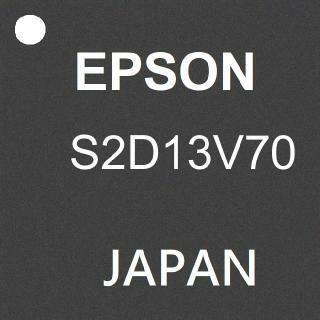 Epson products are recognized for energy saving, low power, small form factors and rapid time to market.